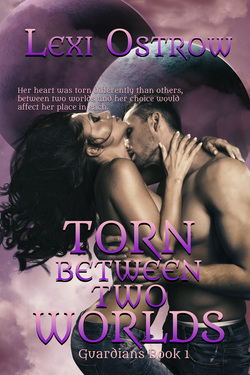 Her heart was torn differently than others, between two worlds. Her choice would affect her position in each. learned she was a Word Speaker, someone who could create life from stories. Her gift is incomplete until her 27th birthday, before then all she can create is things she, and others like her can see. Evil wants her gift as well and the characters she chooses to create become her Guardians against the unseen attackers that want to use her skill. Just before her 27th birthday, fate has a surprise for her. Stryder is a demon, created to be a backup plan for the Horseman of the Apocalypse, War. Since the day he learned he was nothing more than pawn he and his brothers had been seeking a way to betray hell and fight on the side of the angels. His world is torn apart again when he finds out he's nothing more than a story and given the option to protect a human female, Ciara, or die. Ciara hates Stryder for replacing her former Guardian. But she cannot deny the lust and connection that rocks through her every time they touch. She could deny it all she wanted, but she belonged to Stryder and when they find themselves thrown into a war bigger than them both she must choose between her reality bound heart and her fantasy bound soul to save them. Julian Michelson is a firefighter in a small town in Alabama. He's been struggling for years to prove to himself that Word Speakers, people who can pull characters from books, exist. Why? Because he's supposed to be one and he's failed every step of the way and a war is supposedly coming. Serena, a princess in fictional medieval Britain, is the epitome of a good girl. She lives to appease her father and her country. That is until she felt a strange voice in her head before waking up and seeing a handsome man through the flames of a fire in a strange world. Now she's stuck in his world and is none to happy with him despite her fascination with the new world and her growing attraction for him. Julian must make amends to Serena, his first and only Guardian, because if she leaves he can kiss his gift goodbye. A lust they can't deny spikes between them as Word Speaker and Guardian and they must decide – are they in the fight together, or do they go their separate ways? Dale grew up fighting for self respect and the respect of others. Being a Word Speaker hadn’t helped. Most of the Guardians he had sought out those that were decidedly darker and fighting on what could be seen as the wrong side of the war. When Ciara gives him her gifts to follow her own happy ending he’s forced to see his self worth and honor her precious gift. Breena is a dark sprite in charge of sneaking through dreams to steal information in a war between the Seelie and Unseelie court in her world. Finding out she’s a book character destined to save the life of a human wasn’t her cup of tea - but it was her father’s. Commanded to get close the Word Speaker Dale so they could all enter his world she’s forced to leave what she knows behind and corrupt a man on the brink of finding himself. When passion ignites between Dale and Breena he finds himself seduced by the darkness once more. He’s tangled up in a web that threatens to change his stance in the war just before his 27th birthday. When her true intentions come out he will have to choose between dark and light, and where he stands in the war. Alcott was a Guardian that failed to be everything his Word Speaker needed and it got him cast out of her world. Anger and betrayal pushed him over the edge. Rather than behaving like the good witch he was, he put up a fight. He struck a bargain with a a virtual God to remain outside his book so he could not only train to be the best Guardian, but hand pick his next Word Speaker. Kellie loved living in New Orleans; the city fostered everything magical and it allowed her to safely be who she wanted to be, and allowed her imagination to soar. 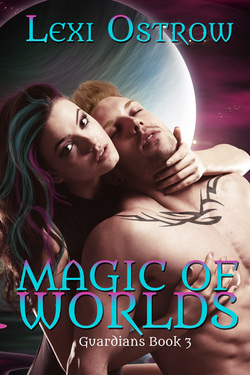 Despite being immersed in magic herself, she isn’t prepared when a man appears out of the blue and tells her she’s a Word Speaker destined to pull life from books and fight in a war. In love withmagic being real, she embraces her destiny with open arms, even if Alcott doesn't appear as interested in her. When Alcott picks Kellie their connection rocks through them both quickly and like a storm. The pair have no problems adjusting to one another and learning what it takes to be the best force the side of good might have in the upcoming war. But when the dark side takes fate into its own hands, the pairs connection and powers will be put to the test. If they’re going to survive they must decide if what they have is strong enough to bring to life. Marie Frost, an Ice Demon, has earned her place as a Guardian. However, the unimaginable had happened when she failed to save her Word Speaker’s life during a small attack. Freed from her story, she finds herself trapped all alone in a world she doesn’t belong in. With nowhere to turn, she begins to close herself off to everything, even the commander of the war. Despite being a solider, Sean Bender, wasn't prepared for the war he would fight with himself when his Word Speaker dies during a military mission. Alone in a world he doesn't belong in, he is grateful he at least has no weird powers or traits that would stop him from assimilating into the crowd and moving on. Jeannette doesn’t want any part of her special Word Speaker gift. Her Guardian died, not from the war, but from something very human—cancer. Left with a young child and a heart broken beyond repair, Jeannette has no desire to ever draw another Guardian and turns her back on her gifts. On the war. Jameson, second to the Horseman of the Apocalypse and known as Pestilence, isn’t new to the game. His brother launched them all into the truth when he became a Guardian, and Jameson has secretly wished for a Word Speaker of his own. All he wants is to escape the fate written for him, and he envies the happiness all three of his brothers have found. On the run, not from evil but from her own life, Jeannette forgets herself and begins to read. When Jameson appears before her, very real and very tempting, she’s thrown into a position she didn’t ever want to be in again. She can’t resist him, even though she wants nothing to do with his kind— Guardians. Jameson must convince Jeannette that they are meant to be, and not just because of the white-hot passion between them. If she can’t accept him, he faces a life left alone and no way to fight in a war that his family already has a stake in. When danger strikes because she is an active Word Speaker, Jameson will sacrifice everything to bring her back safely.